Elaine Grace Kalms was received into the more immediate presence of her Lord on Monday, September 24, 2018 which would have been her 76th Wedding Anniversary. 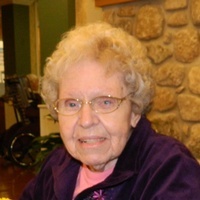 She was born on September 29, 1921 in Sturgeon Bay to Louis and Grace Koessl of Sister Bay. Her parents at that time lived at Horseshoe Bay Farms in Egg Harbor where her father was employed. They later moved to their permanent home on Old Stage Road in Sister Bay. She attended the Wildwood Grade School and graduated from Gibraltar High School in 1939. She lived her entire life in Sister Bay except for the time she spent working in Chicago for the Friedlund family. On her parent's wedding anniversary September 24, 1942 she married Walter W. Kalms at the Sister Bay Moravian Church. They shared 49 years of marriage. She was a lifelong member of the Sister Bay Moravian Church having been a Sunday school, vacation bible school teacher, a member of the ladies aid and served as an Elder on the church board. At the time of her death she was the oldest member of the church where she was baptized, confirmed and married. First and foremost mom was a wife, mother and homemaker. Summers were spent in the cherry orchards sorting cherries that were picked by the migrant workers. During the war, German soldiers picked the cherries for our grandfather's and father's orchards. Mom recalled one such soldier coming up to the window of the house with his hands in the air. She then figured out he wanted to wash his hands at the outside faucet. When she felt it was possible and the children where old enough she worked outside of the home as a waitress at Rudy's Restaurant, at the Fruit Grower's Cooperative and then a job she enjoyed doing for Stories, Inc. in Sister Bay quilting, making draperies and furniture. In May of 1972 she and her husband celebrated the Grand Opening of Kalms Propane in Sister Bay. She was the official bookkeeper and the only secretary allowed to sit on the owner's lap. Due to dad's health they later sold the store and enjoyed their retirement time together. Never one to be idle she then did sewing for Carol Gresko and Alicia Mulliken in Ephraim. Mom was a talented seamstress, knitter, crocheter, baker and loved tending her flower gardens. On her many visits to Colorado she was always up for a plane ride with her grandson, Aaron, as he prepared for his pilot's license. She and Matthew enjoyed many trips to Sturgeon Bay together and time spent at the family home. She became a resident at Scandia Village in 2003 where she put her talent for knitting to use making over 300 knitted dolls for the Board of World Missions that sent those dolls to the mission field hospitals for children in Tanzania. Elaine is survived by her children Walter L. “Bud” Kalms (Pat Michelsen); Trudy (Ron) Fandrei, of Ellison Bay; Steve (Janet) Kalms of Sister Bay and Vicki Shepit of Sister Bay and Evergeen, Colorado. She is also survived by grandsons Aaron (Amanda) Shepit of Ellison Bay and their children Alexander, Elizabeth and Aislin; Bryan Shepit of Westminster, Colorado; Matthew (Anissa) Kalms of Sturgeon Bay and their children Siciily, Gunnar and James; Zachary Kalms, granddaughters Kristin and Cheryl; her sister June (Emery) Koehler of Sister Bay; several nieces and nephews; and her godsons, Gene Sunstrom and Daniel Knutson. She was preceded in death by her parents, husband, daughter-in-law Gerilyn Kalms, sisters and brothers-in-law, nieces, nephews and most recently her nephew and godson, Kenneth Lee Dahlstrom and lifelong friend, Marian Lichter. The memorial service will be held at 11:00 A.M. on Thursday, October 18 at the Sister Bay Moravian Church with visitation from 10:00 A.M. until the time of service. Pastor Kerry Krauss officiating. Graveside services took place at the church cemetery on Wednesday, September 26. In lieu of flowers, memorials may be sent to the Sister Bay Moravian Church at 10924 Old Stage Road in her memory. The family wishes to thank the CNAs and nurses of Scandia Village for their compassion and love given to mother over her fifteen years of residency. She enjoyed her bingo, whammo and horse races very much. Above all we thank God for giving us such wonderful parents who gave us such a memorable childhood, taught us right from wrong and gave us unconditional love. Casperson Funeral Home in Sister Bay is assisting the family. Expressions of sympathy, memories, and photos of Elaine may be shared with her family through her tribute pages at www.caspersonfuneralhome.com.